Offering equal doses of architectural eye candy and natural treasures, this high-flying adventure is piloted by a pro who knows all the best vantage points. By far, it’s one of Cleveland’s most epic helicopter tours. It gives you photo opportunities of the downtown core (including all the sports arenas!) and Lake Erie's beautiful shoreline before taking you out to Ohio City. Offering equal doses of architectural eye candy and natural treasures, this high-flying adventure is piloted by a pro who knows all the best vantage points. Be awarded new winning shot every few seconds (it goes without saying that this helicopter tour is a must for shutterbugs)! 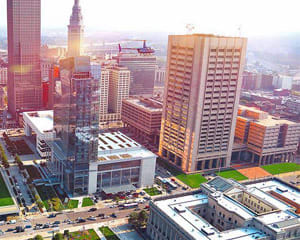 Soar above Cleveland's skyline for 30 minutes! To start, swoop over FirstEnergy Stadium, Progressive Field and the Quicken Loans Arena. Next, appreciate views of Lake Erie and its bustling shoreline. Travel to Lakewood, Rocky River and as far our as Ohio City! Snap stunning shots from your Robinson R44’s wide windows! But the flight isn’t just for photography lovers. It’s the ideal jaunt to celebrate a birthday or anniversary. Not to mention, the rich, diverse scenery is incredibly romantic.